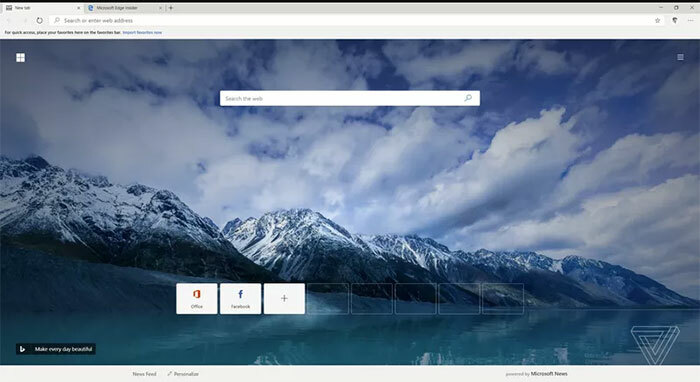 Over the weekend Microsoft's revamped Edge browser, based upon the Chromium core, has leaked out and been tested by numerous enthusiasts and tech reporters. On Saturday The Verge claimed an exclusive with its screenshots showing the Chromium-powered Edge in action. This morning I saw SlashGear report on the new browser, citing a Chinese BBS source for its imagery. Back in December HEXUS reported that Microsoft had confirmed it would adopt the open-sourced Chromium code to transform Edge. At the time Microsoft's Joe Belfiore sketched out plans for Edge/Chromium on the Windows Blog. The central assertion behind the change was that adopting the Chromium open source project would "create better web compatibility for our customers and less fragmentation of the web for all web developers," according to Belfiore. At this time it was estimated that the move to a Chromium-compatible web platform for Microsoft Edge on the desktop would take about a year. Microsoft indicated that it would try and retain its Edge advantages such as "the best-possible battery life and hardware integration on all kinds of Windows devices." 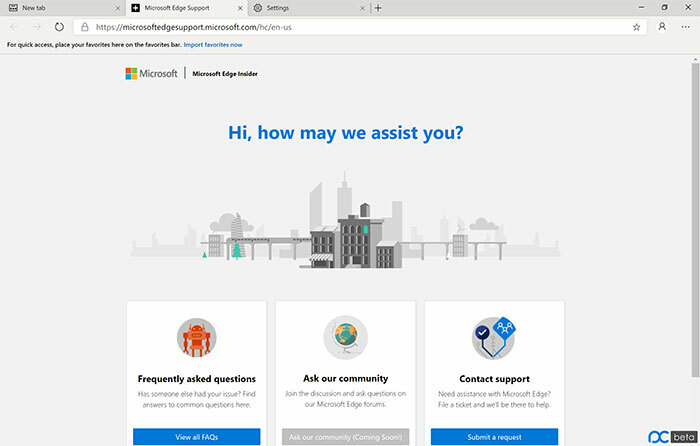 When you first install the new Chromium version of Edge, Microsoft will prompt you to import favourites, passwords, and browsing history from Chrome or Edge, reports The Verge. Later on in the process you can choose a style for the default new tab page. Then, once in the program, you will notice the UI offers a mix of the Chrome and Edge designs. It is noted that compared to a previous leak the newer browser has moved further away from the Chrome look and feel towards Microsoft's current Edge deigns. Some features Edge users will be familiar with like the read aloud web page accessibility option are now present, but others like the 'set aside tabs' feature and web page 'inking' aren't enabled as yet. Furthermore, there is a dark mode for the new browser but it is enabled via a testing flag at this time. A big change to the Chromium-based Edge will be with regard to extensions. Chrome extensions will be available to users of the new Edge. 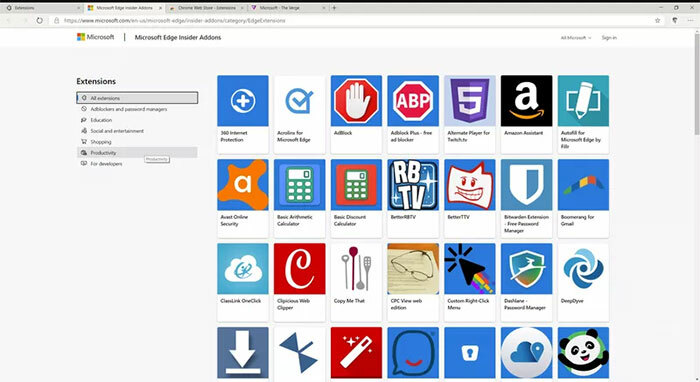 Users can toggle two extension sources; a curated source of extensions explicitly enabled by Microsoft (the current pick is available to browse on the Microsoft Edge Insider Addons web page), or extensions direct from Google's store. In the view of early testers of the new Edge, it seems to be quite stable and run rather well. For example, a couple of Google Chrome extensions from the Google store worked as expected. As an early version, The Verge says the browser software "feels very polished". Thus it thinks that it won't be long until the new version of Edge will become available to the public beta testers via the Windows Insider programmes. Google and chrome are now becoming the IE of the current internet with their ‘custom code’ so rather than try and run with their own, they're just changing the core engine of their browser to work the same. Standardised code is pointless when the browser with the largest market doesn't follow them all while ‘promoting’ it.